Jasminanthes is a genus of seven species found in southern China, Japan, mainland Southeast Asia and Sundaland. It is characterized by large flower with salverform corolla and inconspicuous to absent staminal corona. However, no species of Jasminanthes have been recorded to date in Laos. During joint fieldwork in Nam Ha National Bio-Diversity Park, Laos, researchers from Xishuangbanna Tropical Botanical Garden (XTBG) collected specimen of Jasminanthes. 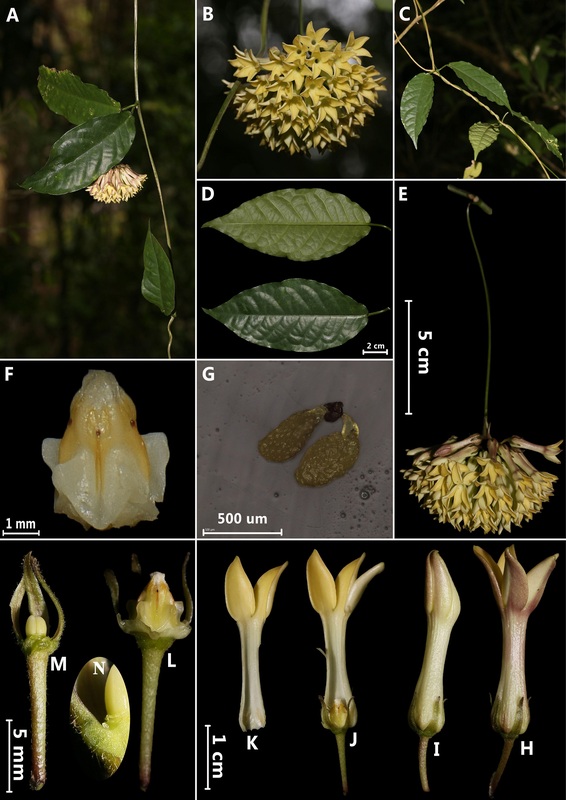 After consulting a large amount of literature and comparing specimens in many herbaria, the researchers confirmed that the species is new to science and the first of its kind in Laos. They named it as Jasminanthes laotica to indicate its geographical origin and got the new species published in Phytotaxa. Jasminanthes laotica is closely related to J. xuanlienensis from Vietnam and shares very long peduncles and plenty of flowers in each inflorescence. But it can be easily distinguished from the latter by its shorter peduncles and in having more flowers per inflorescence, longer sepals, and obtuse to subcordate lamina base. Its inner corolla lobes are bright yellow and the outer corolla lobes are salmon-pink. Jasminanthes laotica was found growing in limestone forest of Nam Ha National Bio-Diversity Park. It flowers March to April. Jasminanthes laotica is known only from the type locality, based on the present knowledge and available data. The researchers thus assessed conservation status as Data Deficient according to the standard of IUCN.